The UK is leading efforts to develop lab-grown meat which could be on supermarket shelves within five years, researchers say. Tissue engineering experts are growing animal cells on blades of grass, as they play their part in helping the UK understand how to effectively scale up production of cultured meat. 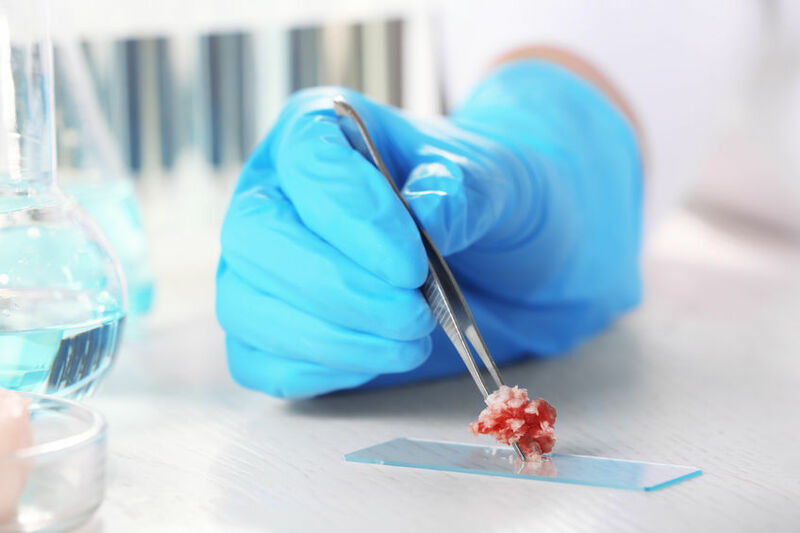 To create cultured or lab-grown meat, a biopsy is taken from an animal such as a pig or cow and then stem cells from that sample are placed in a bioreactor in a laboratory, where they are fed a solution of glucose, amino acids, vitamins and minerals. This blend of cells and nutrients in specific conditions will allow the cells to develop into mature muscle cells that will form cultured meat. The University of Bath researchers said if this process can be reproduced then meat-eaters could 'soon be enjoying a slaughter-free supply of meat products'. The current texture of cultured meat makes it best suited to sausages and burgers. However, the researchers hope that products such as steak and bacon rashers will be developed in the future. Lab-grown meat products are not on sale yet in the UK, however, a number of companies in the US have created edible products including a burger, and meat balls. Dr Marianne Ellis from the University of Bath said: “The UK really is one of the key essential players globally on the scale-up so that is what we're working on as engineers, developing systems to grow the cells on a large scale. The researchers believe there are advantages to lab-grown meat, namely helping address the world’s future food needs as well as reducing greenhouse gas emissions as part of efforts to tackle global warming. The research comes despite a new study which says that meat grown in a laboratory may do more damage to the climate in the long run than meat from cattle. Experts from the Oxford Martin School say that current proposed types of lab-grown meat may not provide a cure-all for the climate impacts of conventional meat production.